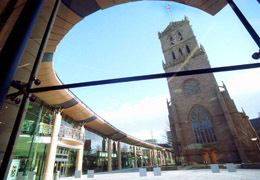 The Steeple Church is located at the heart of the city centre surrounded by the Overgate shopping centre and within a few minutes walk of both universities. Our church building dates back hundreds of years. However, as a congregation we live very much in the 21st century, believing that God is still working in and through his people, with Jesus Christ the lving centre of our fellowship. We would like to welcome those who are studying in Dundee and offer the opportunity of being part of a Christian Church that seeks to demonstrate and share the love and good news of Jesus Christ in the city and culture in which we live. As a church we are committed to responding to the practical needs of people using our city centre.